Spring is here the sun is out and the UK's holistic weight loss boot camp programmes are starting to heat up as well. The winter months seem to have passed us by already and the boot camp programmes for women and men in the UK are starting to gear up for a busy period. FitFarms is a fitness retreat with a difference it does not just look at short term or seasonal weight loss. The FitFarms weight loss retreat takes a long term view on their guests health and fitness. The camp even offers a 3 month after care programme which is online and offline. The programme has been designed to change the way people think about exercise. Then when guest go home there is more chance for the healthy lifestyles and fitness levels to be maintained. The United States of America health organisation has just reported another 4 percent increase in obesity. This figure has increased every year since 1989. More people now die of eating too much than too little in the United States of America. The holistic weight loss boot camp also offers a more softer approach with offering towels, robes and complimentary shower gels that their guest can use during the seven day stay at the fitness retreat. Last year the £100 discount spring promotion did not end until mid summer due to the huge success of the spring months. The holistic boot camp suggest to book early this year due to being ahead on bookings. The retreat is full on all the March months and the next available date is not until 20th April. 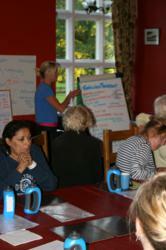 The weight loss retreat use to run retreats for the big superstore giant Tesco PLC from 2007 up to and including 2011. The supermarket chain unfortunately stopped their fitness retreats due to a very competitive market place. The company then kindly agreed to send their clients to FitFarms which has certainly helped with increasing the numbers on the weeks. There is also a maximum number that the weight loss boot camp will take which is 25 but it would be more fair to say that the average over the year is 22. The ratio of guest to trainers is five to one which does not include the chef and all the specialised fitness camp instructors. If you want a space it maybe a good idea to spring ahead today and take the boot camp up on their seasonal offer.